I'll start this article by stating that due to the short comings of salmon fishing agents who have no professional 'hands on' experience in the industry watching river gauge water heights has sadly become an obsession with many Scottish salmon fishers. This nonsense has distracted many anglers from great opportunities to catch salmon on the Scottish rivers each year. I recall a guest by passing his introduction with myself as the Head Ghillie to walk right down to the water gauge and stand there for several minutes poised like a heron to see if the river was rising, stable or falling. When he eventually came to introduce himself I told him in all the years I'd been on the river I'd never seen a salmon staring at the water gauge once! I think he realised the valid point I was trying to make. 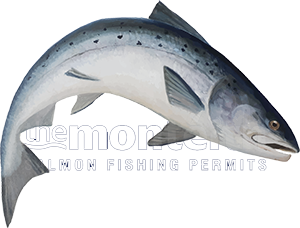 If you're wating for perfect water conditions in this game you can wait a very long time and if you're lucky enough to experience them there is still no guarantee salmon will be present to be caught. To secure good quality salmon fishing in Scotland it must be booked well in advance so you've got to work with what you're faced with on arrival at the river. Salmon thankfully don't read the same books we've all been conditioned to trust and it often amazes me when I observe the most unlikely low water river conditions come alive when a run of fresh salmon cause commotion as they enter the pool. Often in the low water of Summer you'll catch fish with pink running marks on their bellies so these fish decided to run and not wait for a lift in the river or the falling water levels after a flood. Success in salmon fishing is about knowing tactically what you're doing coupled with high persistency levels over the full course of the fishing day. Focussing your thoughts on the speed and depth of your fly or lure are very important factors too. The real advantage you need is that often unpredictable bit of luck that positions you in front of a taking fish and all of the above has got absolutely nothing to do with a water gauge reading. The unpredictability of our sport is one of its big attractions and turning up at a river where the conditions are less than favourable to your mind's eye has nothing to do with whether or not salmon are present or can be caught. The skilled salmon fisher will see this as a challenge and make them even more eager to pull the 'rabbit out of the hat' even if the beat ghillie has said 'it's a waste of time' which are the most dangerous words spoken in this great sport.